Tech-Dry® Protectasilane 100W is a water-based silicone water repellent concentrate, containing 100% active silane/siloxane. 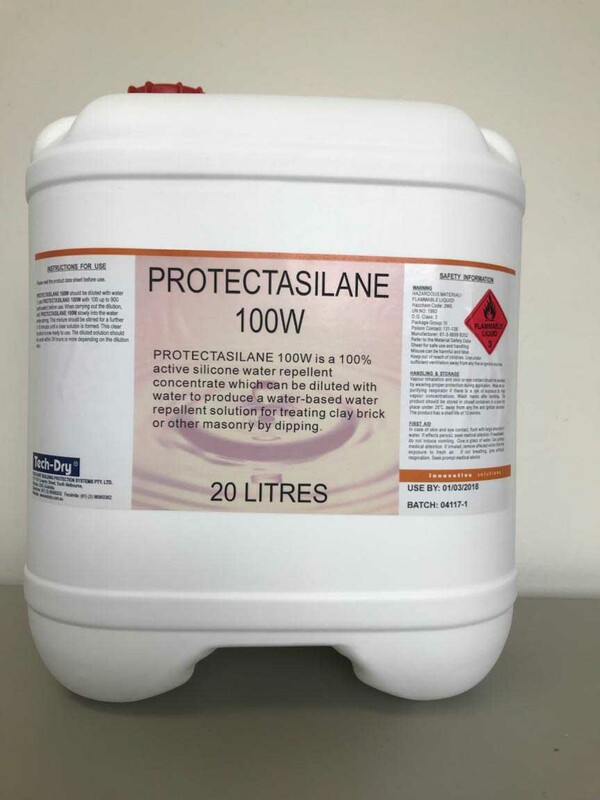 Protectasilane 100W is neutral and contains no salts and no solvents. It is recommended as a water repellent sealer for protecting permeable masonry substrates. Use as a fired clay brick sealer or other masonry substrates to protect against water penetration and efflorescence by either dipping or spray applications. The product is typically designed to replace sodium or potassium siliconate solution as a clay tile or clay brick sealer by dipping application in factory. The product may also be used for spraying application either in the production line or used on site for masonry substrates. To apply Protectasilane 100W, especially as a clay tile or clay brick sealer, the concrete products are dipped into the solution in the factory. This product may also be used for spraying applications, either in the production line or used on site for masonry substrates. 100% active readily soluble in water containing no salts or solvents. Deeply penetrates and permanently bonds to the masonry substrates. Forms UV, alkali stable and durable siloxane crosslinking structure becoming part of masonry substrates. Reduces water penetration and prevents efflorescence.